— in which they located a specific memory in a mouse’s brain and designed a system to activate and deactivate it at will — might remind people of these movies. And there is a good reason for that: because the experiment was, in part, inspired by them. 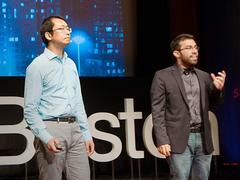 In today’s talk, given at TEDxBoston, Ramirez and Liu share more about their motivation for studying memory manipulation. They also walk us through the steps of their research which, after being published in the journal Science, made waves in the international media. First, Liu, Ramirez and their team needed to get creative in order to isolate a single memory in a mouse’s brain. Next, they had to figure out a switch for this memory — and they came up with a method that involves a laser beam. Finally, they experimented with activating the memory, even in the wrong context. Ramirez certainly has a point: Hollywood has long been fixated on the mystery of memory, with a heavy focus on what happens when it’s manipulated. Below, a look at just a selection of movies that deal with twists of memory. Total Recall. In this 1990 classic, a construction worker visits the company “Rekall,” in order to have the memory of a vacation to Mars implanted in his mind. The procedure backfires. Soon, he learns that he is not who he thinks he is at all — but that he’d previously wiped his memory of an entire life on the red planet. Memento. The 2000 film Memento, directed by Christopher Nolan, is a story told in two directions — both in reverse and chronologically. In it, a man with anterograde amnesia (Guy Pearce) is not able to store new memories, and thus uses tattoos, notes and photos to give himself bits and pieces of his dark, complex reality. Inception. Ramirez referred to his most recent study as “Project Inception.” Why? Because in this 2010 movie, also from Christopher Nolan, a corporate thief (Leonardo DiCaprio) sets out on what he believes is an impossible mission: to plant an idea in another person’s subconscious through a dream, a thing referred to as “inception.” The movie is both a visual feast and a complete mind workout. 50 First Dates. In this 2004 romantic comedy, a man (Adam Sandler) attempts to woo a woman with memory loss (Drew Barrymore), who after a car accident wakes up every morning thinking it is October 13, 2002. This means that the man has to charm her on repeat, day after day. A light comedy, yes, but still one Ramirez credits for his interest in the science of memory. The Manchurian Candidate. In this thriller from 1952, the son of a political family is kidnapped during the Korean War along with his platoon. He is brainwashed, and programmed to be an assassin — a killer with no knowledge of what he is doing. Over the course of the movie, his war buddies begin to realize something is amiss, and try to figure out what has happened. Trance. This psychological thriller, released in the spring, is probably too new to be considered a classic. But we’re including it here regardless because of the themes in the Danny Boyle film. The basic plot: an art auctioneer is part of a plot to steal a painting, but receives a blow to the head that leaves him unable to remember where the painting is. He turns to a hypnotist for help. The Bourne Identity. Jason Bourne (Matt Damon) is an incredible assassin — fluent in many languages, a great fighter and quick with weapons. Only, he has no memory of why. In this 2002 Doug Liman film that launched a franchise, Bourne tries to discover who he is, while the CIA tries to take him out.